APPROX. 1.35 FROM BARREL CROWN WITH CRUSH WASHER INSTALLED. IF YOU PIN ON A 14.5″ BARREL, MAKE SURE THE BOLT FACE TO END OF BRAKE IS >16.000″ UNLESS TO ARE MAKING A NFA REGULATED WEAPON. 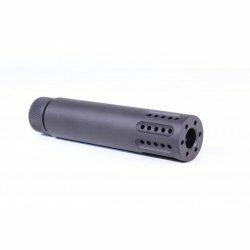 T-BRAKE MUZZLE COMPENSATOR (5.56MM) – BY DIAMONDHEAD – FREE SHIPPING! RED™ BRAKE 7.62MM NITRIDE – FREE SHIPPING!